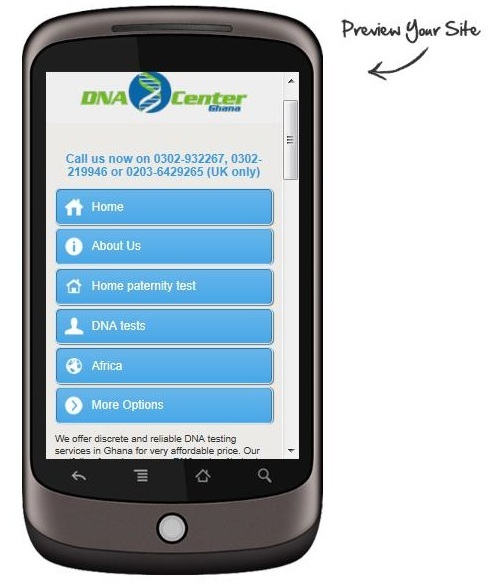 12th November, 2012, Accra, Ghana – DNA Center Ghana launched their first version of mobile website today to increase the accessibility of the information about its DNA services by Ghanaians without the regular access to internet on PC desktop or laptop. It was proven by nationwide survey, performed by Bioquest Consulting, that mobile platform with its data services including internet and related online applications is prefered and widely used mode of accessing the internet. Almost 85% of our target audience uses the mobile (smartphone, iPhone, blackberry or PDA) to browse and download information from the internet. Our mobile version of dnacenterghana.com makes navigation through the website in the mobile browser user-friendly without compromising the quality of the content and website functionalities. Also, you do not need to remember two different internet addresses (one regular and one mobile), our application will recognize when the website is accessed from the mobile browser and switches from regular website in to the mobile version. DNA Center Ghana is the first healthcare company offrering the information to its potential clients via mobile platform in Ghana. We hope, that this step will benefit Ghanaians outside big cities and in the remote rural areas of the country. This way we can share the information and news with entire country in easy and well structred way.